A homeless man in Arizona had a lucky escape after he became trapped in a garbage truck for 10 miles, only to be rescued when a worker eventually heard his screams for help. 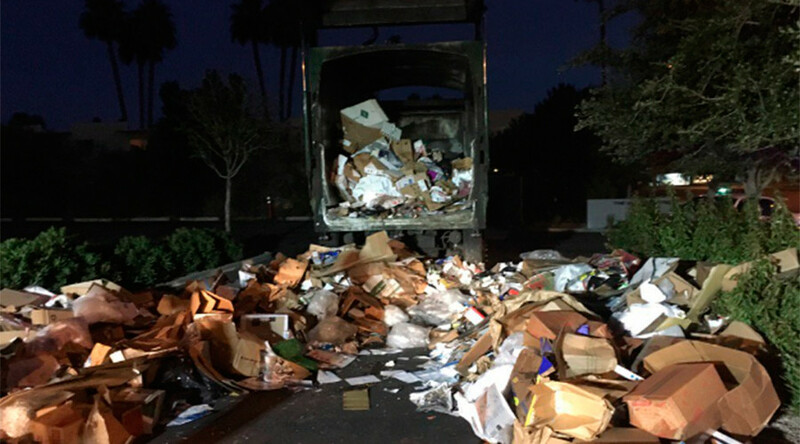 With nowhere to go the 28-year-old, who hasn’t been identified, slept in a dumpster in Scottsdale overnight but then became trapped after the bin was emptied into the truck early Thursday morning. The man remained trapped inside the truck for 10 miles, and was compacted twice, according to KSAZ, with the the volume of cardboard boxes in the truck helping to save the man’s life. According to a tweet from Scottsdale Fire Department, the driver was only alerted to the man’s presence after he heard screams coming from inside the truck. The truck was partially emptied in a parking lot where the man was then removed. He was treated by paramedics for a head injury but has since been sent to a local hospital to check for internal injuries as a result of the compacting.